We offer 24 unique, cozy little chalets, finished in red spruce and arranged in well-spaced clusters to ensure privacy. 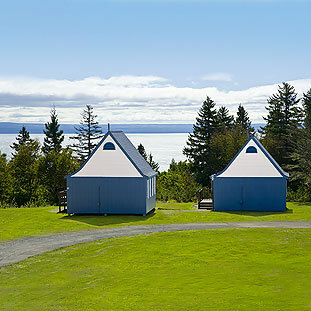 Each chalet has a private deck and many enjoy fabulous views of the rugged coast of Nova Scotia and the Bay of Fundy. 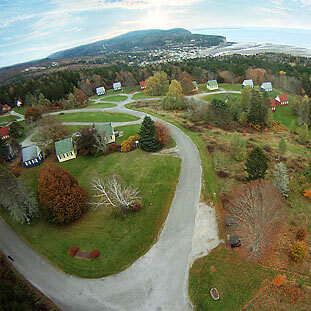 Of our 24 chalets, we have 18 bed-sitters and 6 one-bedroom units. On-site playground for children with plenty of room to run and play safely. Air conditioning provided naturally from the Bay of Fundy. Bathroom with shower (the one-bedroom units have a full bath). Kitchenette with small refrigerator, stovetop, microwave oven, coffee maker, cooking utensils and cutlery. We continually strive to give our visitors the comfort and convenience they expect, while still respecting the traditional charm that makes our chalets a perfect retreat for couples or small families. You will find our rates very reasonable and affordable for families. See our current rates and reservations policy.